Below a brief list of monuments with descriptions and photos. Soon I will add schedules, although they tend to change slightly from year to year. The Alhambra is one of the reasons many come to visit Granada. But there are plenty of other sights to check out. Enough to make at least a one night stay the minimum althought I would stay many mroe! Also, there is always more to see than just the major monuments of a city, and one of my favorite things to do in just about any city is simply walk around different neighborhoods. Granada is no exception. You will find churches, plazas, shops and buildings that are interesting but never make it on the list of "official" things to see. First on the list is of course the Alhambra. Do buy your tickets at least a day in advance (see the below section). Some weekends the tickets are sold out, and some days the best hours are sold out. If you have a short amount of time in Granada and want to make the most out of it then knowing your time in advance will help. Also, you avoid hiking up the hill only to find you can't enter for another 3 hours. A century ago much of the complex was in ruins, although you would never know it today. In my own divisions, there are 4 main parts of the Alhambra complex as a visitor: the Nasrid Palaces, the general buildings, the Palace of Carlos V and the Generalife. Of all, the Nasrid Palaces may be the most impressive and for this reason entry time is strictly controlled with your ticket purchase. I will add some more information, but I do not plant on becoming the expert source for general history of the Alhambra. 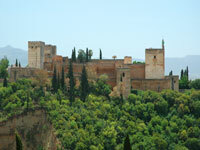 Below you will find some links to sites which cover the Alhambra very well. More information on buying your tickets can be found below before visiting the ServiCaixa web site. Go directly to the section selling Alhambra tickets through the following domain: www.alhambra-tickets.es.. You may wish to spend the whole day exploring the Alhambra and recovering from the visit which can be hard on your feet. They were lucky, and you could be, too. But how much to do you want to see the Alhambra? Do you want to risk not seeing it? That you have to answer for yourself. They are likely the people who encourage you to “wing it” when travelling, the romantic idea of travel without any reservations or planning. Fine. This may depend on your idea of what is fun (and adventure), so again something to consider yourself. Having “winged it” before I have many very interesting stories to tell. I also have: slept on a cold train station floor in Innsbruck and became very ill; slept on a sketchy park bench in Granada; arrived in a small town in Germany only to find out that EVERY room was booked for a festival and had to catch another train out after 4 hours of looking for a place to stay; Found myself in the dessert in Morocco with two cars, one with a flat tire and the other without gas (tip: siphon gas from car with flat tire and get on your way). Again, great stories, but if I remember correctly I did not necessarily enjoy myself while these things were happening to me. So, even you enjoy winging it, are you breaking any rules by purchasing a ticket in advance? How much time do you have in Granada? Arriving with 24 or 48 hours to see the city and the Alhambra without tickets may leave you without tickets, or a time which is less than ideal, and could interfere with you catching a train or bus, and thus a hotel or hostal reservation in another city. And with little time on your hands if you want to visit the same day you have to make your way up to the Alhambra and buy tickets, where you may learn your time to visit the Nasrid Palaces is 8 hours later. Do you know the regional and national holidays well? Do you know what a “puente” is? A regional or national holiday could fall on any day of the week. If it is close to a weekend, then it creates a “puente”, or a long holiday weekend. Example: a holiday on Tuesday means many people will take off Monday to enjoy a 4 day weekend. You may think on a Monday there are no problems to get tickets, and then you find out the Monday us part of a puente! I mention this because in November we did not book in advance and did not get to see the Alhambra because of a regional holiday that had many people visiting Granada. Now that you are ready (or not) to purchase tickets remember they can only be purchased a maximum of 90 days in advance. If it is not too early follow the instructions below. Go to the page www.alhambra-tickets.es/ At the top of the page there is an option for English. 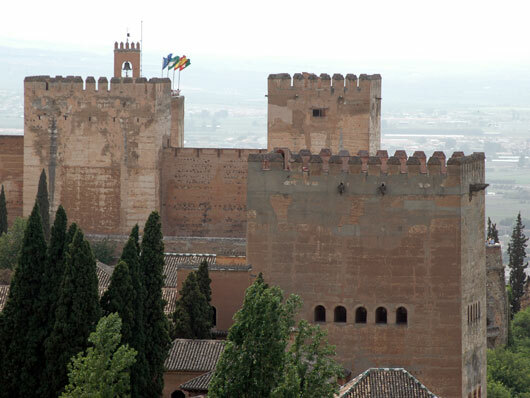 Select General Visit to the Alhambra and Generalife, then select the day you want to visit. Select a “Time Band” for when you want to visit. Selecting this will decide the time range for which you will have to enter into the Nasrid Palaces. 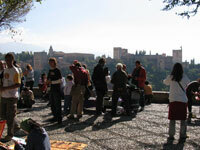 However, you are free to enter the other parts of the Alhambra and Generalife before and after. For example, if you choose the morning slot you can visit other parts of the complex before your scheduled entry time to eh Nasrid Palaces, then visit the rest after your entry. Just because the morning time states until 14:00 does not mean you have to leave the Alhambra at that time. So relax and only worry about entering the Nasrid Palaces on time. If you are presented with only one time band, it is because the remaining time bands are sold out. Scroll down to select the number and type of tickets. On the web site there is a maximum of 10 tickets per order. If you do not like the time given, you can go back and start the process over and see what entrance time is assigned to you (repeat steps 1,2 and 3 above). If there are not many tickets left for your day or time band, there is a risk of it selling out when you do this! Make sure the credit card used will: 1) Not expire before the date of your arrival and 2) Be one of the cards you travel to Spain/Granada with. In order to pick up your tickets in the machines at the Alhambra, you must use the same card. Especially pay attention to 1) above. If your card expires before you arrive you may (mistakenly) think you would be ok by bringing the new card your credit card company has issued you since your card expired. The machines need the exact same card, so your new card with your new expiry date will not work to pick up the tickets! 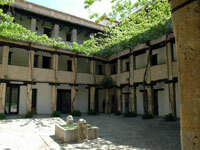 Make sure the dates and summary are correct, and that you are certain you will be in Granada. There are no refunds once purchased unless you refute the charge with your credit card company. The charge will go through almost immediately. Make sure you are using a computer where you can print the confirmation page. You will not receive an email confirmation. So if you prepared then enter your personal and payment information, and click “Continue”. You will see confirmation page with a summary and reference numbers. PRINT THIS PAGE! As mentioned above, you will not receive a confirmation email. In other cases: Say you have arrived in Granada and did not buy tickets. Perhaps you’re flying by the seat of your pants, or maybe by chance you have just stopped off in Granada. The day before your arrival you can purchase tickets at any ServiCaixa machine. If you have problems making the transaction you can, in some branches of La Caixa, purchase within the bank. Same day tickets have to be purchased at the Alhambra. Remember you may be able to visit just the Generalife if you cannot get entrance into the Nasrid Palaces. The gardens adjacent to the Alhambra complex are one of the main attractions when visiting the Alhambra itself. Acres and acres of pools and ponds, summer palaces, sculpted bushes, flowers and fountains offer a restful spot with views of the Albaicin. The Generaife is one of the reasons a visit to the Alhambra can take so long. Once you have finished visiting the main complex and the Nasrid Palaces you may think you are close to finished. But allow at least an hour for the Generalife, more if you want to take things in slowly and rest a little in the shady spots. Plus there are good views of the rest of the city, especially the Albaicin neighborhood. The Generalife can be visited on it's own should tickets be sold out to the Alhambra and Nasrid Palaces. If you can't get in to the Alhambra because you just have one day and arrived without tickets, it is worth trying to see just the Generalife. As with many of the cathedrals in southern Spain, Granada's is located on the site of a former mosque. 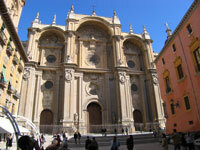 Queen Isabela (la Catolica) commissioned the Cathedral to be built. Almost two centuries later (work was completed in 1704) the Cathedral was finished in a mix of styles reflecting the changes over the years. 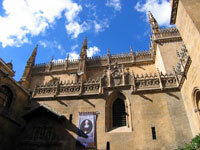 The original plans were for a Gothic Cathedral in the style of the Cathedral of Toledo. Later plans changed the style to Spanish Renaissance, and the Cathedral is now said to be the first Renaissance church in Spain. While certainly smaller in size, if you compare the Cathedral in Granada to the one in Sevilla you will notice more light enters into the building than in Seville. 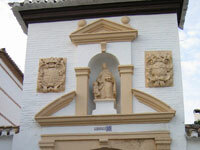 The Capilla Real is attached to the Cathedral but requires a separate entrance (and fee) to see the resting place of the Catholic Kings, Isabela and Ferdinand. The Reyes Catolicos commissioned the construction as their final resting place in Granada because it was the last city to fall in the Christian Reconquest in 1492. Within the capilla is a display of the royal treasure as well as a nice collection of Flemish paintings which once belonged to Isabela. 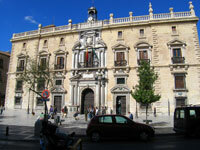 Address: Calle Oficio and surrounding streets to Plaza Bib Rambla. 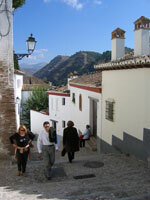 The Albaicin quarter holds an enormous amount of Granada’s historic buildings and plazas. The area was once several neighborhoods and stretched out further than the existing quarter today. The neighborhood is often referred to as the former Arab quarter of the city, although one can find signs of Granada’s history from more than just this period. The quarter buildings are numerous in purposes now. Restaurants, bars, as well as many accommodations (hotels and tourist apartments) have popped up over the years. The Calle Nueva Calderería is a narrow street starting close to the Plaza Nueva, holding tourist shops, numerous tea houses, a few restaurants and other small merchants typical of the times of the Arab quarter. 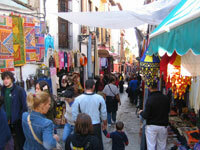 There are some similarities to the typical streets one might find in a medina in Morroco. While it's not close to the scope of the medinas in Morocco and other countries, you can find a wide variety of goods, ceramics, rugs, clothing, lamps, furniture, spices, teas, a bakery or two, and more. Several churches and casa-palacios are also scattered throughout the neighborhood. The Albaicin also is home to many dwellings typical of the quarter, known as carmenes, with views of the Alhambra and garden terraces. And the impressive views of the Alhambra can be enjoyed from a number of miradores, of which the most well known is el Mirador de San Nicolas, a favorite spot for visitors to take photos of the Alhambra with the Sierra Nevada mountains as a backdrop. The main sight of this sight is really the Alhambra. And the Mirador mentioned on this site is really just a sight within an above mentioned sight (it's located in the Albaicin). Sorry for the confusion and fun I'm having with you...The Mirador is a plaza with a wonderful overlook, with the best views of the Alhambra and the Sierra Nevada mountains behind it. The best time to visit the Mirador de San Nicolas is before the sunset. You can get good pictures of the Alhambra during the end of the day and then some fantastic night shots.While it is nice to see the Alhambra from the Mirador in the morning, the sun is often behind the Alhambra making for poor photos. There are always plenty of people hanging around, mostly other tourists and often a few stret musicians. The Calle Nueva Calderería is a narrow street starting close to the Plaza Nueva, holding tourist shops, numerous tea houses, a few restaurants and other small merchants typical of the times of the Arab quarter. 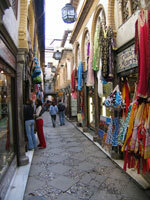 There are some similarities to the typical streets one might find in a medina in Morroco. While it's not close to the scope of the medinas in Morocco and other countries, you can find a wide variety of goods, ceramics, rugs, clothing, lamps, furniture, spices, teas, a bakery or two, and more. The name, Corral del Carbon, or coal yard, comes from the use after the Reconquest, when coal merchants came to the city. Constructed in 1336, the original structure was an Arab guesthouse with a typical layout of a corral de vecinos: living quarters surrounding a central patio. It has undegone recent renovations one can find a little tourist information inside. Over the centuries the building was repurposed for many different uses until it fell into disrepair. Entrance is free. The 11th Century Arab bath house is perhaps one of the best preserved in Spain. Columns and marble pieces from Roman and Visigoth times were reused, as was often typical in construction of this period. Also typical was the division of rooms by temperature: cold, warm and hot. The baths were used by residents of neighborhood. Work on the Cartuja monastery began in 1506, the same year as the Capilla Real in the city. The sacristy is said to be one of the finest examples of the Spanish Baroque styles. The monastery itself is a mix of Baroque, Renaissance and Gothic styles. Within the monastery are impressive paintings by artists such as Sánchez Cotán and Bocanegra, as well as wonderful marble, wood and glass work. One of Granada’s finest examples of Renaissance architecture and art, the San Jeronimo Convent was the first monastery to be founded in the city after the Reconquest. Over five hundred plaques can be found in the Monastery, in memory of the monks who lived in the complex. The church of the monastery was the work of Diego de Siloé, and perhaps his finest work. Restoration of the monastery began in the late 1950’s and was completed in the 1970’s. It is now the home of cloistered nuns, and for this reason now really a convent! In the lower Albaicin, just a few blocks away from the Plaza de San Miguel, we find the Convento de Santa Isabel la Real. 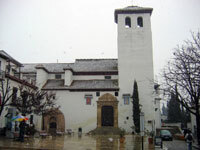 Much of the convent was renovated in 1998 before opening parts of the complex to the public. It was founded in 1501, shortly after the Reconquest, and was the work of Enrique Egas, the architect of the Capilla Real (Royal Chapel) adjacent to Granada’s Cathedral. Schedule: Just before and during mass: Mon-Sat: 18:30, Sun: 11:00, 12:00, 18:00. Note: mass times will change (winter and summer months). Considered one of the best remaining churches of Mudejar architecture in the city, the Church of San Gil and Santa Ana is just across the Plaza Nueva from the Royal Chancery. Constructed in the 16th century according to the plans of architect Diego de Siloé, the church was built on the site of a former mosque. The church contains several chapels, an impressive Plateresque doorway, and a church tower with several balconies. Located just next to the Mirador de San Nicolas, the church sadly burned to the ground in 1932. 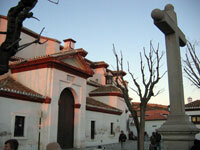 Now rebuilt, it is still considered one of the oldest Mudejar churches in the city of Granada. As with many churches in this quarter, it sits on the former site of a mosque, although hardly anything is left of the mosque. 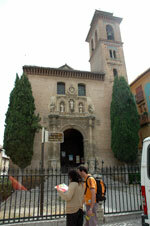 For another Mudejar church, visit the Iglesia de San Gil y Santa Ana in the Plaza Nueva. The San Miguel Church dates to the year 1501, and like many churches built just after the Reconquest, was constructed on the site of a mosque. In the 1530’s and 1550’s the upper and lower portions of the church were completely converted to (more or less) its present state. Remains of the mosque include a cistern as well as the typical horseshoe shaped arch supported with Roman columns on one side. The long, open Plaza de San Miguel Bajo in the lower section of the Albaicin is, in my opinion, also a worthy sight in itself. Several restaurants and bars with outdoor tables make this a nice little spot to rest for a drink or meal. As with the Albaicin, it's recommended to have a good pair of walking shoes before heading up the hill of Sacramonte. Many visitors arrive to see the cave houses along the narrow streets, with the final arrival at the Sacramonte Abbey. Always a curiosity, the cave homes provide natural air conditioning in the summer yet keep warm in the winter. There are plenty to visit at night as well, where tourists come to see flamenco shows in a spot known for it's charm and history. During the day you can make your way to the Sacrmonte Abbey for a visit, which should include taking in some of the works by famous artists who at one time resided in Granada.